How much weight have you lost and how long did it take? Since joining Nutracheck, I have lost 13st 1lbs183lbs83kg in total – it took me 18 months. Thank goodness for the Internet! I knew counting calories worked, so I searched online for 'calorie counting', and the results brought up something called Nutracheck. After a bit of research, I knew this could work for me. I used to write down everything I ate but it wasn't always easy to find and record calories accurately, so having the Nutracheck App do all the calculations made it so easy. I had tried all kinds of diet plans and found them confusing and hard to follow. I also felt that I was being 'punished' whenever I tried to lose weight: being constantly told what not to eat isn't very inspiring - Nutracheck's not like that! Has your weight stayed fairly consistent over the years, or have you always had to manage it? I was large as a child and have always been a big eater - and the weight stayed with me and came to dominate my adult life. Before I joined Nutracheck, I weighed around 28 stone and my self-esteem was very low. I felt at rock bottom. From the day I joined Nutracheck, I was on a mission. I set myself a target, which was to lose a lot of weight: I knew what I needed to do. How easy was it to fit the changes you made into your lifestyle? 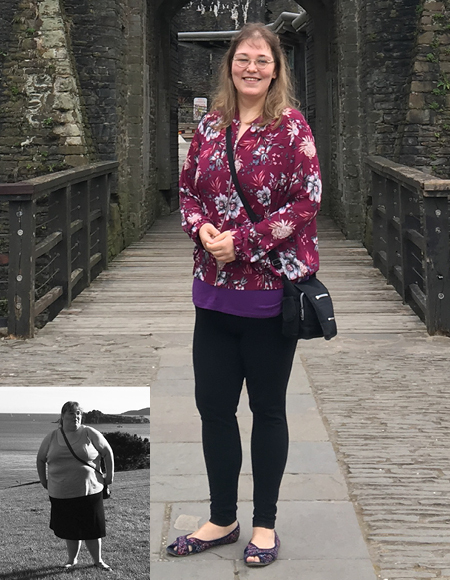 I found the Nutracheck approach really easy to fit into my busy lifestyle, and I was very motivated because I could see my body shape changing. I attend the gym 2-4 times a week, I used to concentrate mostly on cardio, but now it's 50:50 as I am now working a lot more with weights to try and tone up. 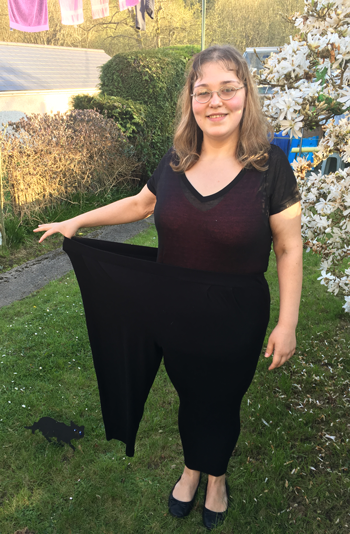 Now, I can fit in one leg of my old gym trousers, and I love being able to walk into a shop and just buy any clothes I want. The compliments made me feel even better, and the weight was still coming off easily! What was the most difficult thing? I must admit that the most challenging thing was altering my portion size. No-one had ever told me how big a 'portion' actually is. I also had to remember to make sensible food choices: those chips might look good, but there's always a better choice. Since losing this weight, my confidence has improved and I don't hesitate to go anywhere; before I was so afraid of being judged because of my size. People continue to stop and tell me how fantastic I'm looking, my health has improved dramatically and I don't feel like I'm 30 - I feel like a teenager again! 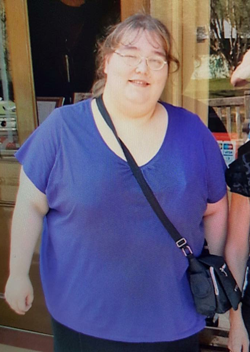 I started this journey as a size 30/32, and I'm down to a size 14/16, which I'm happy with for now. The only downside to losing so much weight is that it has left me with quite a lot of excess skin around my tum, my underarms and my thighs. I'm in a new relationship and I love being outside walking in the fresh air which I hated before. 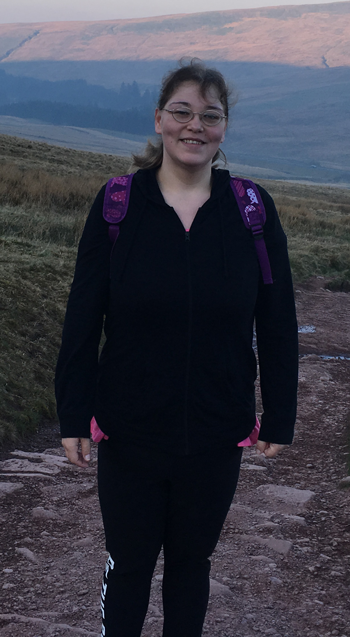 I managed to climb Pen y Fan in April - it's 886 metres high and is the highest peak in South Wales. I found it much easier than I thought and I can't wait for new challenges. I'm determined to keep the weight off - my goal now is to get rid of this excess skin - and I'm remaining focused and positive. I always offer my support and help to anyone who comes to me asking for advice. I have had a lot of people who I have not met before see my story and progress through other peoples Facebook profiles, who have added me looking for help. If you want it, have it - just cut something out later. That way you won't get cravings. Get used to sugar free drinks: I used to hate them - but now they taste good.